Attention grasp. Stress positions. Water dousing. Rectal rehydration. These are some of the government’s sanitized terms for the “enhanced interrogation techniques” that the CIA used on captives held at secret locations overseas during the George W. Bush administration. They mask the brutality that many prisoners faced for months or years under the agency’s interrogation program, as outlined in the landmark 2014 report from the Senate Intelligence Committee. What if there were a way to make sense of state-sanctioned torture in a more visceral way than by reading a news article or watching a documentary? Two years ago, that’s exactly what a team of Pittsburgh-based video-game designers set out to create: an experience that would bring people uncomfortably close to the abuses that took place in one particularly infamous prison camp. In the game, which is still in development, players assume the role of an American service member stationed at Camp Bucca, a detention center that was located near the port city of Umm Qasr in southeast Iraq, at an undetermined time during the Iraq War. Throughout the game, players interact with Iraqi prisoners, who are clothed in the camp’s trademark yellow jumpsuits and occasionally have black hoods pulled over their heads. The player must interrogate the prisoners, choosing between methods like waterboarding or electrocution to extract information. If an interrogation goes too far, the questioner can kill the prisoner. Players also have to move captives around the prison camp, arranging them in cell blocks throughout the area. Camp Bucca is best known for incubating the group of fighters who would go on to create ISIS: The group’s leader, Abu Bakr al-Baghdadi, was held there for five years, where he likely forged many of the connections that make up the group’s network today. The developers say they chose to have the player wrestle with cell assignments to underscore the role of American prison camps in radicalizing the next generation of fighters and terrorists. The developers relied on allegations of prisoner abuse in archived news articles and a leaked Red Cross report to guide their game design. While there were many reports of prisoner abuse at Camp Bucca, they were never so widespread as to prompt an official public investigation. Worried for their safety if their names were associated with what’s likely to be a controversial video game, the designers, a group of five graduate students at Carnegie Mellon University and New York University, asked to remain anonymous in this story. I was put in touch with two of the game’s lead designers by a colleague who works with one of them in a Carnegie Mellon computer lab. (The game is not affiliated with either university.) I did not, however, get a chance to play the game, or see any gameplay footage, beyond six screenshots the designers sent me. Without playing through the video game, it’s hard to know how well the team’s ideas will translate to the screen. But just the concept—a game rooted in recent history that allows players to engage in interactive torture—is enough to get started. I asked Brenda Romero, a prominent video-game designer who’s currently a course director in the computer science department at Ireland’s University of Limerick, about her experience using games to address thorny issues. Starting in 2008, Romero created a series of board games called The Mechanic is the Message, which draws players into difficult moments in history: the slave trade, the Trail of Tears, the Holocaust. In the game Train, players must cram yellow figurines into model boxcars and try to move each to the end of the tracks on the board. Only once they arrive is it revealed that the destination they were trying to reach is Auschwitz. The Camp Bucca game, too, uses structure to make a point. Throughout the game, the player accrues points by completing assigned tasks, or loses them by failing. But the points never amount to anything. The game can’t be won. Back in 2014, the design team had set out to create a fictional horror game. But when one of the members started to read about Abu Ghraib, the Iraqi detention facility that became synonymous with prisoner abuse and torture, he learned of abuses at Camp Bucca that he felt were underreported. Shifting the focus of the game to Bucca made sense in the context of the horror game they were already planning to build, the designer said. After operating for nearly two years in complete secrecy—few outside the development team even knew the game existed—they launched a test balloon. In May, one of the developers granted an anonymous interview to the local CBS affiliate in Pittsburgh, sharing just a few broad-strokes details for a two-minute segment. Though the coverage was vague, it was enough to spark some impassioned commentary on Facebook, most of it negative. More than one person said that they’re excited to play even though they don’t usually enjoy video games, suggesting they were drawn to the idea of torturing virtual Iraqis. 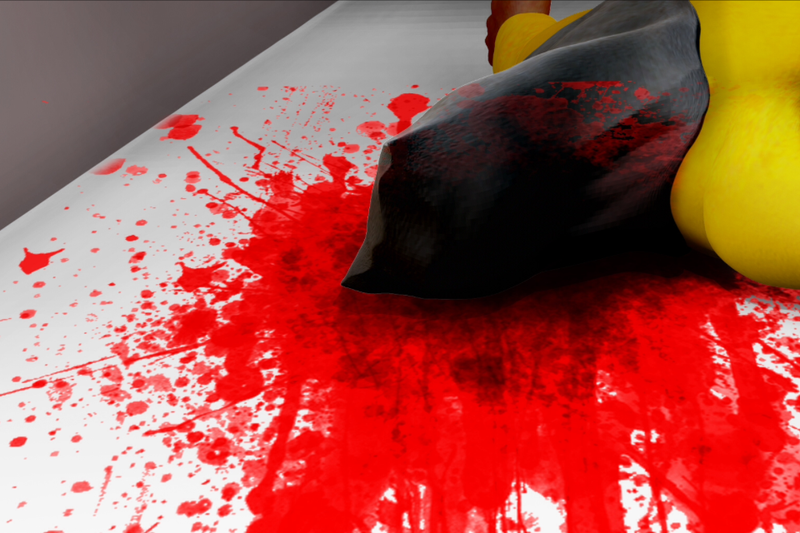 There’s precedent for using torture as a gameplay tool in video games—a controversial mission in the most recent Grand Theft Auto game, for example, requires the player to waterboard a man to extract information he was willing to give before the torture even began—but what’s new is placing interactive torture in the context of real-world events whose legacy remains raw. Eight years ago, the journalist Clive Thompson called for “more” and “better” torture in video games, because games are particularly good at walking players through cause and effect: Do this, and something else will (or won’t) happen. In Camp Bucca, the developers set up a logical chain they want players to follow: Torture, and you will create ISIS. The question of just how how close to bring participants to torture is a familiar one for for Nonny de la Peña, a journalist and virtual-reality pioneer. In 2007, she and Peggy Weil, a digital artist, made a model of the Guantanamo Bay prison camp in Second Life, a platform that lets users create avatars for themselves and interact with others’ avatars in a virtual world. The digital camp was painstakingly reconstructed from the accounts of former prisoners and the scant available official sources, but de la Peña chose not to subject players’ avatars to torture, instead allowing them to peacefully explore a “torture contemplation area” populated with news headlines and poems written by detainees. Two years later, de la Peña created IPSRESS, a virtual reality experience that thrusts the viewer even deeper into Gitmo. The specter of torture is nearer still than it was in the previous project: Placed in a small, plain cell, the viewer can hear an interrogation next door, which de la Peña had an actor recreate based on detailed logs of Mohammed al-Qahtani’s captivity at the detention camp. Looking down, viewers see that their character is wearing an orange jumpsuit. To the right, a mirror reveals that the viewer’s character is arranged in a “stress position,” crouching on a small box with his hands clasped behind his back. De la Peña said some viewers later said they remembered crouching during the experience, even though they weren’t. To get around the roadblocks that kept de la Peña from showing acts of violence, the creators of the Camp Bucca game were willing to extrapolate from the information they had. There are only so many details publicly available about conditions at the camp, so the designers filled in the blanks. But until the Camp Bucca game is released—likely later this year—it’s impossible to know how it will be received, and if it can attain its goals without trivializing violence or turning torture into a cartoon.